My good friend J. dropped off a few turnout blankets for Tristan last week. They are in need of some minor repairs, and re-waterproofing. I dropped one of the blankets off for repair (I don’t have a sewing machine that will punch through the strapping), and yesterday tackled the first of the re-waterproofing. I thought I’d do a bit of a guide, since many blankets lose their waterproofing after only a season or two but are otherwise good blankets. 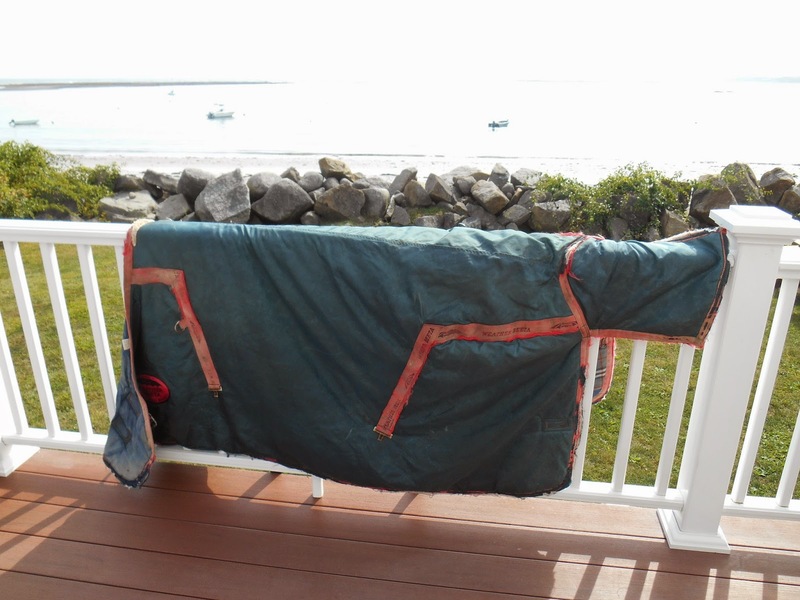 Since a wet horse is almost always a cold horse, keeping a blanket waterproof is important. No matter what waterproofing you choose, this is important. The waterproofing chemicals have to bond directly with the fabric. 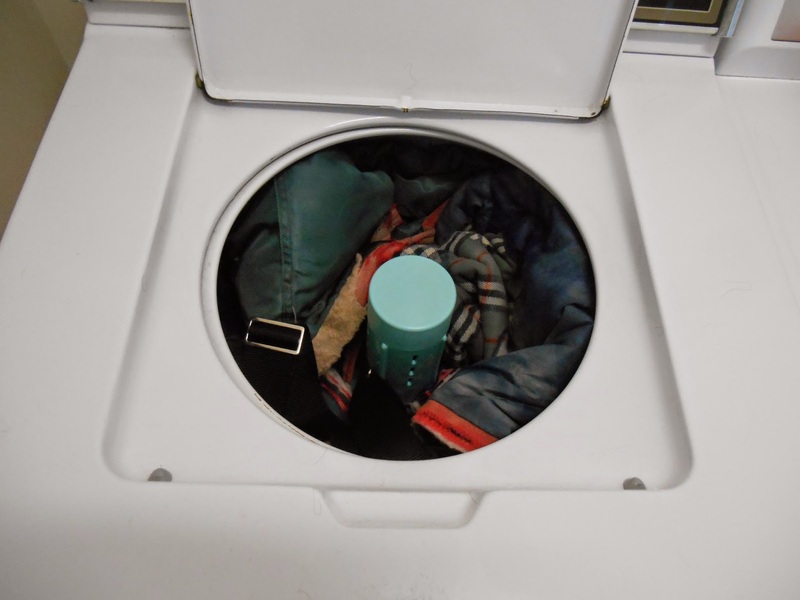 So if it’s at all dirty or dusty, toss it in the washing machine before you get started, and let it dry thoroughly. Waterproofing stuff comes in a variety of options, but the vast majority are going to be a spray-on application. I went to Walmart and spent some time in their camping section reading labels. I chose this one because it had the most volume and only needed one application. I paid $5.97 for this can, which is 13.125 ounces. I used almost all of it on one 72″ blanket, so I’ll need to go back and get more! Find an airy and sunny place outside – this is the front porch of my family’s house in Maine, where I was this weekend doing wedding stuff. It’s very important that the weather be sunny and dry for a period of several hours, as this stuff really needs to dry very thoroughly or the waterproofing is ruined. It’s also really something you can’t do inside, as the chemicals stink and can be dangerous to inhale. 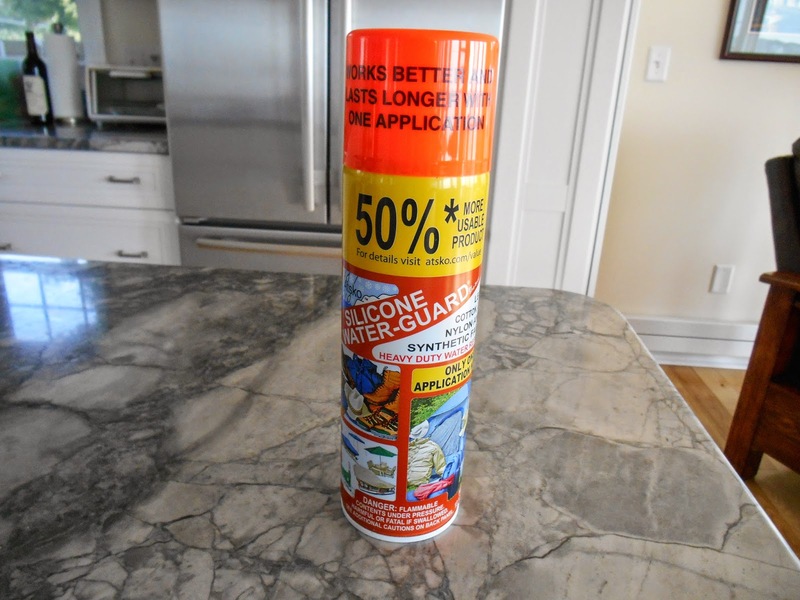 Hold the can about 8″-10″ away from the blanket and spray the waterproofing on. Make sure you completely coat the blanket and get the fabric good and wet, every nook and cranny. In the past, I’ve waterproofed items by spreading the out on the grass, but I had the porch here and the yard was covered in dew. Most systems strongly suggest a full 24 hours of drying time. This is something that should be done well in advance of actually needing the blankets. A sunny day is really key here: you can get it a good couple of hours of drying outside at least. I pulled this blanket inside when we were ready to leave for Vermont, and it’s ready to head to the tailor to fix a few small rips on the inside lining that I discovered while washing it. Good to know! My turnout blankets are several years old and have seen better days- I'm sure they could use some re-waterproofing! good idea! also – what an awesome view from that porch!